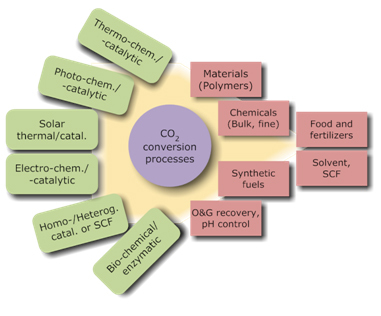 The Carbon Dioxide Capture and Conversion (CO2CC) Program is a membership-directed consortium, launched in January 2010, whose members are involved in developing, monitoring and utilizing the “state-of-the-art” in technological progress and commercial implementation of carbon dioxide capture and conversion. The program’s objective is to document and assess technically and commercially viable options for the capture/clean-up/utilization of CO2 and its mitigation via energy efficiency gains which meaningfully address the challenges posed by CO2 life-cycle and overall sustainability issues. By the direction of the member companies (through balloting and other interactive means) and operated by TCGR, the program delivers weekly monitoring communications via email (CO2CC Communiqués), three techno-economic reports (highly referenced and peer reviewed) and scheduled meetings of members (either in-person or via webinar). Access to deliverables is exclusive to members. In addition to the program deliverables, TCGR works with members to identify and foster competitive advantage and opportunity. This value-added relationship, along with active participation by the membership, leads to improved (or unique) external R&D and commercial investment possibilities.